St.Helier's local battalion of the Home Guard was the 57th, Mitcham. Doreen Porter's father, George Wilkes, was a sergeant with them. His depot was in a hall in Buckhurst Avenue and she attended Christmas parties there as a child. To observe and report enemy attack and infiltration in their area; to delay any advancing army for as long as possible; to protect vital places like railways, factories, telephone exchanges and reservoirs; to guide the regular army where necessary. * They took their duties seriously and drilled regularly. During an air raid on Mitcham on the night of 16/17 April 1941, eleven members of the battalion were killed. Despite their commitment and professionalism, Doreen can still remember one event which is worthy of an episode in "Dad's Army". Well they had to practice what would happen if anyone ever invaded. He was in uniform and it was mainly going down to the hall to arrange different things that they would have to arrange for wartime and help the ARP men as well. And then they sort of practised manoeuvres around the area - different areas - trying to conceal themselves should, at any time anybody, invade us. Maybe some residents found the enthusiasm of the Home Guards a little too overbearing. David Fenn remembers being challenged. This page was added by Cheryl Bailey on 19/06/2010. There were Home Guard units at Mullards as well as the one which met in the hall in Buckhurst Avenue. Does anyone know if there were any more local to the estate? The men that died while serving with 57th, Mitcham Home Guard. MITCHAM (CHURCH ROAD) BURIAL GROUND, Surrey, United Kingdom SHARMAN, Volunteer, RICHARD JOHN, 57th Surrey (Mitcham) Bn., Home Guard. 16 April 1941. Age 17. Son of Mrs. D. E. Sharman, of Mitcham. Grave Ref. Plot 7. Grave 1. MITCHAM (LONDON ROAD) CEMETERY, Surrey, United Kingdom BRANCH, Volunteer, CHARLES ALBERT, 57th Surrey (Mitcham) Bn., Home Guard. 16 April 1941. Age 32. Son of Henry Owen Branch and Ann Hope Branch; husband of Lillian Branch, of Mitcham. Grave Ref. Plot 14. Grave 8551. FORRESTER, Serjeant, HUGH KENNETH, 57th Surrey (Mitcham) Bn., Home Guard. 28 January 1942. Age 48. Son of James Henderson Forrester and of Elizabeth Fanny Forrester (nee Bew); husband of Nelly May Forrester, of Mitcham. Also served in 1914-18 War. Grave Ref. Plot 10. Grave 10603. HENSON, Volunteer, JAMES WILLIAM THOMAS, 57th Surrey (Mitcham) Bn., Home Guard. 17 April 1941. Age 18. Son of James and Sarah Rosina Henson, of Mitcham. Grave Ref. Plot 14. Grave 8592. 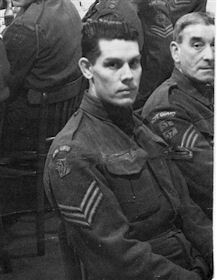 JONES, Volunteer, WILLIAM, 57th Surrey (Mitcham) Bn., Home Guard. 16 April 1941. Age 36. Son of John Hugh and Alice Jones; husband of Clara Olive Jones, of Whitehaven, Cumberland. Grave Ref. Plot 14. Grave 8572. KILBEE, Volunteer, JOSEPH STANLEY, 57th Surrey (Mitcham) Bn., Home Guard. 16 April 1941. Age 18. Son of Joseph and Florence Frances Kilbee, of Norbury. Grave Ref. Plot 14. Grave 8531. LABRUM, Lieutenant, CHARLES JAMES, 57th Surrey (Mitcham) Bn., Home Guard. 16 April 1941. Age 43. Son of Charles James Labrum and Jenny Labrum; husband of Florence Labrum, of West Croydon. Grave Ref. Plot 14. Grave 8611. LANGBEIN, Volunteer, HAROLD FRANCIS, 57th Surrey (Mitcham) Bn., Home Guard. 16 April 1941. Grave Ref. Plot 14. Grave 8571. NEWSTEAD, Volunteer, FREDERICK ALFRED, 57th Surrey (Mitcham) Bn., Home Guard. 16 April 1941. Grave Ref. Plot 14. Grave 8552. O'BRIEN, Volunteer, FREDERICK THOMAS, 57th Surrey (Mitcham) Bn., Home Guard. 16 April 1941. Age 18. Son of Patrick and Emily Florence O'Brien, of Thornton Heath. Grave Ref. Plot 14. Grave 8512. PEACEY, Serjeant, WALTER JOSEPH, 57th Surrey (Mitcham) Bn., Home Guard. 16 April 1941. Age 36. Son of Walter Thomas Peacey and Mary Ann Peacey, of Battersea, London. Grave Ref. Plot 14. Grave 8591. TAVERNER, Volunteer, GEORGE STEPHEN, 57th Surrey (Mitcham) Bn., Home Guard. 16 April 1941. Age 32. Son of John Francis and May Emma Taverner; husband of Annie Florence Taverner, of Mitcham Junction. Grave Ref. Plot 14. Grave 8532. WHITE, Lieutenant, ARTHUR FREDERICK, 57th Surrey (Mitcham) Bn., Home Guard. 19 April 1941. Age 38. Son of George and Ellen White; husband of Florence White, of Mitcham. Grave Ref. Plot 14. Grave 8631.